By cesarean section, Rina Attard gave birth to two young daughters, both alive, but Siamese twins. The law had some experience with Siamese twins but never as it would be with little Gracie and Rosie Attard. On August 8, 2000, at Xagħra, on the small Maltese island of Gozo, time stood still. 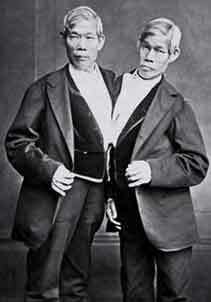 There had been the famous Siamese twins who coined the phrase, Eng and Chang Bunker (both 1811-1874; pictured). They took turns being in charge of their activities; each twin had an alternate day. The Bunker twins eventually married two sisters in Wilkesboro, North Carolina. In 1100, the Maids of Biddenden, Kent (England), Elisa and Rosie Chulkhurst were joined from hips to shoulders, and a national fascination in medieval England. When one of the sisters died, the option was given to the survivor to be quickly and surgically separated (without anaesthetic), in a last-ditched attempt to save her life. She refused saying "as we came together, we will also go together." The surviving sister died six hours after her sister. "There is, indeed some kind of legal argument that a monster is not protected even under the existing law…. (Siamese) twins present a special case, though they are treated in medical works as a species of monster. Here the recent medical practice is to attempt a severance, notwithstanding the risks involved. Either the twins are successfully unlocked, or they die." But the legal issues and ramifications raised by Hollywood Siamese twins (the Hilton sisters; see YouTube video reference below), pale in comparison to the profound legal issues which arose in the all but 10 months of life that would be given to one of the Attard twins. Mr. and Mrs. Attards had been married for only two years and were struggling. Michelangelo Attard was unemployed and Rina's employment ended with her pregnancy. They knew from of an ultrasound that Rina was carrying conjoined twins. Only two hospitals in the world specialized in Siamese twins: one was the Children's Hospital of Philadelphia. Because of a medical treatment reciprocal agreement between England and Malta, the Attards flew to England, and the children admitted to St Rosie's Hospital in Manchester in anticipation of the unique complications in the delivery of conjoined twins. There, the lead surgeon, Dr. Adrian Bianchi, was also Maltese. Both babies were born alive but with fused hip bones, and shared genitalia, bladder and some heart features. Each had their own brain, lungs and liver and kidneys. Gracie thrived and quickly showed healthy movement in her independent body parts. More importantly, her heart was doing well although showing signs of oxygen deprivation. But Rosie was not. Her brains seemed underdeveloped and experts surmised that she would be unable to function with normal intellectual or cognitive ability. Medical experts added that Rosie was only alive because of Gracie; that Gracie's heart was cleaning her sister's blood and nourishing her body. Her lungs were described as "not functioning". "Gracie's heart provides sub-total perfusion of Rosie's tissues. Gracie is essentially pumping for the vital organs of both twins as they breathe." Medical experts predicted that if the twins were left conjoined, Gracie's health would be irreparably compromised; she would be unable to walk or sit up and she may experience infantile heart failure given the additional responsibilities in regards to her sister's needs. Eventually, given that there was only one heart functioning at capacity, Gracie's kidneys and brains would eventually fail; the prognosis: three to six months; and she would take Rosie down with her. "Do we murder Mary to save Jodie?" "Rosie is, sadly, self-designated for a very early death. Nobody can extend her life beyond a very short span. Because her heart, brain and lungs are for all practical purposes useless, nobody would have even tried to extend her life artificially if she had not, fortuitously, been deriving oxygenated blood from her sister's bloodstream…. "That is the sad fact for Rosie. She would not have lived but for her connection to Gracie. She lives on borrowed time, all of which is borrowed from Gracie. It is a debt she can never repay." In this tragic medical context, the doctors convened a most difficult meeting with the parents. The Attards were given the best medical opinion: Rosie could not be saved in any event. If her and her sister were left conjoined, she would eventually, and very soon, cause the death of both of them. However, Gracie could be "salvaged" if separated soon. The parents asked if the separation could wait until, as the doctors predicted, Rosie died? The doctors replied that attempting to save Gracie in those circumstances would result in a 60% mortality risk, compared to 6% if the separation was immediate. They described the operation. They would invest in Gracie; the medical terms used were "biased towards Gracie", but only insofar as necessary. The pelvic bone would be cut and the spinal cords unravelled. The ultimate moment would be the cutting of Gracie's aorta which fed into Rosie's heart. They knew when this happened, little Rosie would die. Rina and Michelangelo Attard said "no"; they would not give parental consent to medical treatment which would result kill Rosie. Devout Catholics, they wanted to put their faith in God. To the Attards, "it would be an immoral act to save Gracie, if by saving Gracie one must end Rosie's life before its brief allotted span is complete". "Though the duty to preserve life is a serious duty, no such duty exists when the only available means of preserving life involves a grave injustice." The medical team disagreed and had no choice but to ask a court of law to save Gracie's life and, of necessity, to permit the extinguishing of that of Rosie. On August 18, 2000, their lawyer filed the necessary paperwork. Without parental consent, the court order was necessary to proceed with the operation. The case was first heard before a judge sitting alone, Justice Johnson of the Family Division. He ordered that the operation should proceed. The parents appealed. And thus, first Justice Johnson and then the British Court of Appeal had to agonize over this spiritual case; recognize the will of the parents to let fate take its course, or to take advantage of medical science and save little Gracie. It is often said that a court of law is not interested in morals or sympathy. Its sole function is to weigh facts against law. "Every person's body is inviolate. "The performance of a medical operation upon a person without his or her consent is unlawful, as constituting both the crime of battery and the tort of trespass to the person. "The law recognises that there is a right and duty of parents to determine whether or not to seek medical advice in respect of their child, and, having received advice, to give or withhold consent to medical treatment. "(But) the common law has never treated such rights as sovereign or beyond review and control …. Overriding control is vested in the court. "In the exercise of its wardship jurisdiction the first and paramount consideration is the well being, welfare, or interest of the human being concerned…. "Best interest encompasses medical, emotional and all other welfare issues." With these words, the cold but common sense of the common law circled the legal wagons around Rosie. "Are these conjoined twins two persons or one in the eyes of the law? "Is this a fused body of two separate persons, each having a life in being? "Rosie cannot cry. She has not the lungs to cry with. "One pities Rosie because her position is utterly dire for she exists pathetically on borrowed time … all of which is borrowed from Jodie. It is a debt she can never repay. "This operation … offer(s) infinitely greater benefit to Gracie than is offered to her by letting her die if the operation is not performed. "Actively to bring a patient's life to an end is to cross the Rubicon which runs between on the one hand the care of the living patient and on the other hand euthanasia - actively causing his death to avoid or to end his suffering. "Vitalism holds that human life is an absolute moral value and that it is wrong either to shorten it or to fail to lengthen it. This is too extreme a position to hold. "The court never sanctions steps to terminate life. That would be unlawful. There is no question of approving, even in a case of the most horrendous disability, a course aimed at terminating life or accelerating death. The court is concerned only with the circumstances in which steps should not be taken to prolong life. "The indispensable foundation of justice is the basic equality in worth of every human being." "The surgery would not be intended to harm Rosie but it would have the effect of ending her life, since her body cannot survive on its own. "Lest it be thought that this decision could become authority for wider propositions, such as that a doctor, once he has determined that a patient cannot survive, can kill the patient, it is important to restate the unique circumstances for which this case is authority. They are that it must be impossible to preserve the life of X. without bringing about the death of Y., that Y. by his or her very continued existence will inevitably bring about the death of X. within a short period of time, and that X. is capable of living an independent life but Y. is incapable ... of viable independent existence." "... excruciating dilemma .... Fifty per cent of the population will agree with the decision, fifty per cent will think we have gone potty." The Attards were allowed a final appeal but perhaps recognizing the futility of it, let it go. On November 7, the 20-hour operation involving 22 medical professionals was completed with only one certain result. Rosie Attard died on the operating table. The two lead surgeons, including Bianchi, decided to cross the Rubicon hand in hand. They held the scalpel together when they cut the aorta, ending Rosie's life within 10 minutes. As Rosie and Gracie had walked together, they would thereafter go asunder. The common law too endured open heart surgery during the public deliberations and final determination of this case by mere mortals armed only with law books. The Attards will never heal but they are doing better. After the surgery, they signed exclusive contracts with media outlets, reportedly earning £1-million. They told the press it was to create a trust fund to cover Gracie's ongoing medical expenses. Once Gracie was sufficiently recovered, the family flew back to Xagħra, where Rosie was buried on January 19, 2001 at a cemetery right smack in the middle of the island. 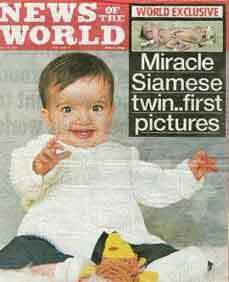 Honouring her parents contractual obligations, Gracie made the cover of the tabloid News of the World as the World Exclusive: Miracle Siamese Twin (see image above). In 2011, Little Gracie was coming up on her 11th birthday. Her medical ordeals will never be over but Dr. Bianchi told the Times of Malta in 2010 that she has "a bright future". At least for now, she is being shielded from media scrutiny by her parents, so she can play, jump, run, giggle, swim in a turquoise Mediterranean. She loves and is loved. She can visit her sister's grave whenever she wants to where she can reflect on the two lives she has to live. Elsewhere, in Malta and around the common law world, Re A stirred up a hornet's nest of medico-legal issues which still buzzes a decade later as these Siamese twins met the law and only one survived. The embers of this gut-wrenching legal trauma still glow in the pages of the law reports, like a spiritual spotlight on a painful but necessary statement of justice, ready to be applied if and when necessary, hopefully as infrequently as possible.